The environmental burden of photovoltaic (PV) solar modules is currently largely determined by the cumulative input of fossil energy used for module production. However, with an increased focus on limiting the emission of CO2 coming from fossil fuels, it is expected that renewable resources, including photovoltaics, may well become more important in producing electricity. A comparison of the environmental impacts of PV modules in case their life cycle is based on the use of PV electricity in contrast to conventional electricity can elucidate potential environmental drawbacks in an early stage of development of a solar-based economy. The goal of this paper is to show for ten impact categories the environmental consequences of replacing fossil electricity with solar electricity into the life cycle of two types of PV modules. Using life cycle assessment (LCA), we evaluated the environmental impacts of two types of PV modules: a thin-film GaInP/GaAs tandem module and a multicrystalline silicon (multi-Si) module. For each of the modules, the total amount of fossil electricity required in the life cycle of the module was substituted with electricity that is generated by a corresponding PV module. The environmental impacts of the modules on the midpoint level were compared with those of the same modules in case their life cycle is based on the use of conventional electricity. The environmental impacts were assessed for Western European circumstances with an annual solar irradiation of 1000 kWh/m2. For the GaInP/GaAs module, the environmental impacts of individual production steps were also analysed. Environmental burdens decreased when PV electricity was applied in the life cycle of the two PV modules. The impact score reductions of the GaInP/GaAs module were up to a factor of 4.9 (global warming). The impact score reductions found for the multi-Si module were up to a factor of 2.5 (abiotic depletion and global warming). Reductions of the toxicity scores of both module types were smaller or negligible. This is caused by a decreased use of fossil fuels, on the one hand, and an increased consumption of materials for the production of the additional solar modules used for generating the required PV electricity on the other. Overall, the impact scores of the GaInP/GaAs module were reduced more than the corresponding scores of the multi-Si module. The contribution analysis of the GaInP/GaAs module production steps indicated that for global warming, the cell growth process is dominant for supply with conventional electricity, while for the solar scenario, the frame becomes dominant. Regarding freshwater aquatic ecotoxicity scores associated with the life cycle of the GaInP/GaAs module, the cell growth process is dominant for supply with conventional electricity, while the reactor system for the cell growth with the associated gas scrubbing system is dominant for the solar scenario. There are uncertainties regarding the calculated environmental impact scores. 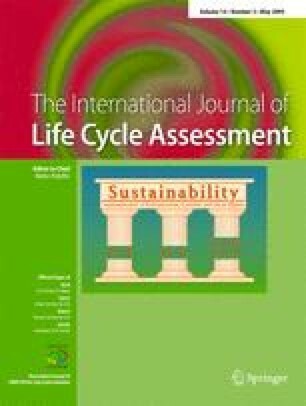 This paper describes uncertainties associated with the used economic allocation method, and uncertainties because of missing life cycle inventory data. For the GaInP/GaAs module, it was found that the global warming impact scores range from −66% to +41%, and the freshwater aquatic ecotoxicity scores (for an infinite time horizon) range from −40% to +300% compared to the default estimates. For both impact categories, the choices associated with the allocation of gallium, with the electricity mix, with the conversion efficiency of the commercially produced GaInP/GaAs cells, and with the yield of the cell growth process are most influential. For freshwater aquatic ecotoxicity, the uncertainty concerning the lifetime of the reactor system for the GaInP/GaAs cell growth process and the gas scrubbing system is particularly relevant. Use of PV electricity instead of fossil electricity significantly reduces the environmental burdens of the GaInP/GaAs and the multi-Si module. The reductions of the toxicity scores, however, are smaller or negligible. Toxicity impacts of the GaInP/GaAs cells can be reduced by improvement of the yield of the cell growth process, a reduced energy demand in the cell growth process, reduction of the amount of stainless steel in the cell growth reactor system and the gas scrubbing system, and a longer lifetime of these systems. Because the greenhouse gas emissions associated with the production of fossil-fuel-based electricity have an important share in global warming on a world-wide scale, switching to a more extensive use of solar power is helpful to comply with the present international legislation on the area of global warming reduction. As reductions in toxicity impact scores are smaller or negligible when fossil electricity is replaced by PV electricity, it is desirable to give specific attention to the processes which dominantly contribute to these impact categories. Furthermore, in this study, a shift in ranking of several environmental impacts of the modules has been found when PV electricity is used instead of fossil electricity. The results of a comparative LCA can thus be dependent of the electricity mix used in the life cycles of the assessed products. The online version of this article (doi: 10.1007/s11367-009-0062-z) contains supplementary material, which is available to authorized users. On a world-wide scale, the greenhouse gas emissions at the production of fossil-fuel-based electricity have an important share in the anthropogenic greenhouse gas emissions (IPCC 2007; Quadrelli and Peterson 2007; OECD 2008). Because the environmental burdens of electricity that is produced by photovoltaic (PV) solar modules are substantially lower than the burdens of electricity that is produced from fossil fuels (European Commission 1995–1998; Dones et al. 2004), it is expected that switching to a more extensive use of solar power is helpful in achieving a reduction of this share. In the past years, life cycle impacts of a variety of PV systems have been evaluated. Most of the studies refer to PV systems based on silicon (Si) solar cells (Gürzenich et al. 1999; Keoleian and Lewis 2003; Dones et al. 2004; Gürzenich and Wagner 2004; Jungbluth 2005; Kannan et al. 2006; Koroneos et al. 2006a, b; Alsema and De Wild-Scholten 2007). A wider variety of types of PV devices is available (Jäger-Waldau 2007), which may vary in their environmental benefit (Alsema 2000; Kato et al. 2001; Meijer et al. 2003; Fthenakis and Alsema 2006; Fthenakis and Kim 2007; Mohr et al. 2007; Raugei et al. 2007). The studies done so far have shown that the electricity consumption in the production process of a PV module determines a significant part of the environmental impacts of that production process because of the extensive use of fossil fuels in the energy production and the associated emissions. Based on ongoing technical developments and a growing share of renewable resources in energy supply (OECD 2008; Bakkes and Bosch 2008; IEA 2008), lower environmental impacts per unit of generated electricity are expected for the future (Frischknecht and Krewitt 2007). A shift from fossil fuels to renewable energy sources most likely reduces the environmental impact of PV modules. One option is the use of PV modules as a breeder to produce the electricity that is used in the production of the same PV modules (Slesser and Hounam 1976; Gusdorf 1992). A comparison of the environmental impacts of PV modules in case their life cycle is based on the use of PV electricity in contrast to fossil electricity can elucidate potential environmental drawbacks in an early stage of development of a solar-based economy. Recently, Pacca et al. (2007) reported 68% reduction of the CO2 emission for a multicrystalline silicon (multi-Si) module and 82% reduction of the CO2 emission for a module based on thin-film triple-junction amorphous Si, in case that PV electricity instead of conventionally generated electricity is applied in the manufacturing of the PV modules. However, they did not report effects on toxicity impacts. The goal of this paper is to assess the environmental performance of a thin-film GaInP/GaAs solar module and a multi-Si solar module in case their life cycle is based on the use of PV electricity. For each of the modules, we substituted the total amount of fossil electricity required in the life cycle of the module with electricity that is generated by the corresponding PV module. Environmental impact scores are compared with those of the same solar modules in case their life cycle is based on the use of fossil electricity. For the GaInP/GaAs module, the environmental impacts of the individual production steps are also analysed in order to identify the steps with the highest relative impacts and thus with the best possibilities for system optimisation. Finally, uncertainties due to missing information for the thin-film GaInP/GaAs module are discussed with a focus on global warming and freshwater aquatic ecotoxicity scores. The functional unit in the present study is a PV module with 1 kilowatt peak power (kWp) at an annual irradiation of 1000 kWh/m2 in Western Europe. The thin-film GaInP/GaAs module is based on a gallium–indium phosphide/gallium arsenide (Ga x In1 − x P/GaAs; x = 0.51) tandem cell that has been developed at the Radboud University Nijmegen, The Netherlands. The manufacturing of the thin-film GaInP/GaAs module is described in detail by Mohr et al. (2007). Figure 1a shows the production scheme of a thin-film GaInP/GaAs solar cell. The cells are grown on a GaAs wafer in an Aixtron AIX 3000 metal–organic vapour phase epitaxy (MOVPE) reactor system (Aixtron 2007). Excess arsine and phosphine are neutralised in a gas scrubbing system. The electricity consumption in the cell growth process is high: In terms of primary energy demand, the electricity consumption in the cell growth process involved covers two thirds of the energy demand in the GaInP/GaAs module production (Mohr et al. 2007). Full-time operation of the reactor system corresponds to an annual production capacity of approximately 0.1 MWp. By means of an advanced epitaxial lift-off (ELO) technique, the solar cell is separated from the GaAs wafer (Schermer et al. 2005); the technique is assumed to allow for 95% reuse of this wafer. A solar energy conversion efficiency of the thin-film GaInP/GaAs cell of 28.5% is considered (Mohr et al. 2007). One kilowatt peak power corresponds to a GaInP/GaAs solar cell surface of 3.51 m2. The multi-Si module is based on a multi-Si cell with 14.4% solar energy conversion efficiency. One kilowatt peak power corresponds to a multi-Si cell surface of 6.94 m2. The production is described in detail by Jungbluth and Tuchschmid (2007). Figure 1b shows the production scheme of a multi-Si cell. The production scale considered here is larger than 1 MWp per year. Silver-based contacts are applied for the GaInP/GaAs cells as well as for the multi-Si cells. For both module types, the specification of the frame, which represents the PV module without solar cells, was derived from the Si solar modules as described by Jungbluth and Tuchschmid (2007). The PV modules are considered to have an expected lifetime of 30 years (Jungbluth 2005; Ecoinvent Centre 2007; United Nations Environmental Program 2008). The Ecoinvent database, version 2.01 (Ecoinvent Centre 2007), was used as a starting point in the inventory analysis. For the production steps of the GaInP/GaAs module which are not included within this database, the average European medium voltage mix (Ecoinvent Centre 2007) was chosen as default for electricity supply. Capital goods were included, but the clean room for the GaInP/GaAs cells was excluded due to lack of data. Both PV systems that generate the PV electricity in the solar scenario were based on the 3 kWp slanted roof installations which are described by Jungbluth and Tuchschmid (2007). Both PV systems include a mounting system. For the GaInP/GaAs cells, the disposal phase was excluded because there is no certainty about the actual post-consumption phase when 30 years from now the modules are disposed. For the environmental evaluation of the solar modules, two scenarios were considered regarding the energy sources of the electricity used: the basic scenario (scenario 0) and the scenario based on solar electricity supply (scenario S). Scenario 0 calculates the environmental impacts of each solar module by use of conventional electricity, which is associated with fossil fuels demand. In the solar scenario S, for each module type, the total amount of fossil electricity in the electricity mixes that are required in the life cycle of each module, and in the associated background processes, is substituted with PV electricity. The PV electricity is generated by the same PV modules. In scenario S, in terms of fossil Cumulative Energy Demand (CED), net 14 GJ/kWp (46% of the total CED) is substituted in case of the GaInP/GaAs module and 10 GJ/kWp (42% of the total CED) in case of the multi-Si module. Fossil electricity is defined as electricity generated from hard coal, brown coal, industrial gas, natural gas, mine gas, oil, and peat. Electricity that is generated with nuclear energy, hydropower, wind energy or solar energy is not substituted. The PV electricity that is used in the life cycle of the PV modules is generated by PV systems that include the balance-of-system components, such as the inverter and the cables. Maintenance of the PV systems and their disposal phase were also included. As the grid in most Western European countries currently allows for substantial additional input of solar power without adaptation (including the addition of storage facilities), the grid is used as a back-up system for temporary surplus of the generated PV electricity. The life cycle impacts of both modules are assessed with the CML 2001 midpoint life cycle impact assessment method (Guinée 2002). Because toxicity impacts in particular may depend on the time horizon which is taken into account, the toxicity impacts are assessed for two time horizons (a time horizon of 100 years, and an infinite time horizon). Calculations were performed with SimaPro 7.1.8 (PRé Consultants 2008). To ease mutual comparison of the indicated impact scores, all impact scores are normalised for the situation in the world in 1995. For the quantification of the environmental impacts of the individual production steps and for the sensitivity analysis, global warming and freshwater aquatic ecotoxicity were considered. Global warming scores reflect mainly the CO2 emissions associated with fossil-fuel combustion. Toxicity scores are related to both fossil-fuel combustion and processes not associated with energy production or consumption. We calculated the normalised environmental impact scores of both PV modules, for scenario 0 as well as for scenario S. The results are shown in Fig. 2. For each of both scenarios, it is found that the environmental scores of the GaInP/GaAs module have the same order of magnitude as the corresponding scores of the multi-Si module. Because relative differences are most important for life cycle comparison, the ratios between single scores of the modules are calculated. Figure 3 shows for each PV module the ratios between the normalised environmental impact scores for scenario 0 and the corresponding scores for scenario S. A ratio larger than 1 indicates that the impact score in scenario S is reduced in comparison with the corresponding score in scenario 0. For both modules, it is found that the impact scores which are mainly related to fossil-fuel combustion, i.e. abiotic depletion, acidification, global warming, marine aquatic ecotoxicity, and photochemical oxidation, have the highest decrease in impact scores when fossil electricity is replaced by PV electricity. For the GaInP/GaAs module, it is found that the impact scores decrease up to a factor of 4.9 (global warming) when fossil electricity is replaced by PV electricity. For the multi-Si module, the impact scores decrease up to a factor of 2.5 (abiotic depletion and global warming) when fossil electricity is replaced by PV electricity. Furthermore, for both PV modules, it is found that the reductions of the impact scores for toxicity are smaller or negligible. This is caused by the decrease in use of fossil fuels, on the one hand, and an increased consumption of materials for the production of the additional solar modules used for generating the required PV electricity on the other. An analysis in more detail of the processes which dominantly contribute to the toxicity categories indicates for the GaInP/GaAs module, that the production of chromium steel which is applied in the cell growth reactor system is most important. For the multi-Si module, the production of aluminium that is applied in the module frame dominantly contributes. Figure 3 shows that the decrease in environmental impact of the GaInP/GaAs module is larger than the decrease in environmental impact of the multi-Si module when PV electricity is used instead of fossil electricity. This leads to a shift in ranking of several environmental impacts, such as global warming and acidification (see Fig. 2). The results of a comparative life cycle assessment (LCA) can thus be dependent of the electricity mix used in the life cycles of the assessed products. It is found that the global warming score reduction of the multi-Si module ensued from our study (a factor of 2.5 = 60%) is close to the CO2 emission reduction of the multi-Si module reported by Pacca et al. (2007; 68%). Differences between the two estimates can be explained by assumptions in the study performed by Pacca et al. (2007) that are different from the present study, such as a solar conversion efficiency of the multi-Si module of 12.9% instead of 13.2% in our study, and different amounts and types of electricity which are replaced by PV electricity. By means of a contribution analysis of the GaInP/GaAs module production steps, normalised scores are calculated for global warming and for freshwater aquatic ecotoxicity for both scenario 0 and scenario S. The results are given in Fig. 4. Each individual production step includes, unless otherwise mentioned, its background processes. Regarding the global warming scores, the energy consumption in the cell growth process is dominant in scenario 0. In scenario S, the impact of the cell growth process on global warming is reduced with a factor of about 25. The global warming scores in scenario S are dominated by the frame and the final cell processing. Regarding the freshwater aquatic ecotoxicity scores, it is found that the energy consumption in the cell growth process is dominant in scenario 0. In scenario S, the following production steps have the highest contributions: the MOVPE reactor system with the gas scrubbing system (which are composed of stainless steel), the frame (which for a large part is based on aluminium and glass) and the cell growth process (caused by the electricity consumption). Contribution analysis results for the other impact categories can be found in the Electronic supplementary material. The contribution analysis for global warming and for freshwater aquatic ecotoxicity shows that the impact scores of the cell growth process are strongly decreased when PV electricity instead of fossil electricity is used in this process. A further decrease can be achieved by improvement of the efficiency of the cell growth process and by reducing the electricity consumption in this process (Mohr et al. 2007). The contribution analysis for freshwater aquatic ecotoxicity shows further for both scenarios that a reduction of the amount of stainless steel in the MOVPE reactor and the gas scrubbing systems, and a longer lifetime of these systems will be the most effective to obtain a reduction of these toxicity scores of the GaInP/GaAs cells. In this section, the uncertainties in the analysis will be discussed, with a specific focus on the influence of uncertainty in the inventory analysis of the GaInP/GaAs module on the environmental performance for global warming and freshwater aquatic ecotoxicity. In line with the Ecoinvent database v2.01 (Ecoinvent Centre 2007), our calculations are based on economic allocation rules (Guinée et al. 2004). Each economic allocation depends, however, on circumstances such as place, time and the production process involved. Therefore, economic allocations can be associated with uncertainty. In particular, for substances which are produced in several ways, with (partly) confidential production data, in estimated amounts, and with a strongly varying supply and demand on the global market, calculated environmental impacts can be affected by economic allocation values. For both gallium (Ga) and arsenic trioxide (As2O3), the influence of different allocation values is considered more in detail here. Gallium is mainly formed as a by-product of aluminium, e.g. in the so-called Bayer liquor besides aluminium trioxide (Al2O3). In line with Ecoinvent database v2.01, an economic value of zero for gallium is considered as default. As an alternative, gallium is allocated on the basis of average prices of gallium and aluminium trioxide in the period 2004–2006 (U.S. Geological Survey 2006–2007). As2O3 is formed as a by-product of copper (Cu), whereby an economic value of zero is considered as default for As2O3. As an alternative, As2O3 is allocated on the basis of average prices of As2O3 and copper in the period 2004–2006 (U.S. Geological Survey 2006–2007). the yield of the GaInP/GaAs cell growth process. Furthermore, uncertainty about the lifetime of the reactor and the gas scrubbing systems is taken into account. For the existing systems, an average lifetime of 20 years is expected, but a lifetime of 10 years is considered as an alternative. Finally, uncertainty associated with the applied electricity mix is taken into account. The average European medium voltage electricity mix (Ecoinvent Centre 2007) is applied as default, while the average Norwegian medium voltage electricity mix, which is mainly based on hydropower, is considered as an alternative. For this, the electricity demand in the cell growth process is considered because this process has the largest share in the electricity demand of the GaInP/GaAs module. Table 1 shows that global warming scores vary between −66% and +28% for scenario 0, and between −6.4% and +41% for scenario S. Freshwater aquatic ecotoxicity scores vary between −40% and +180% for scenario 0, and between −12% and +300% for scenario S. For both impact categories, the uncertainties associated with the allocation of gallium, with the composition of the electricity mix used in the reactor system for the cell growth process and the gas scrubbing system, with the conversion efficiency of the commercially produced GaInP/GaAs cells, and with the yield of the cell growth process are relatively high in both scenarios. For freshwater aquatic ecotoxicity, the uncertainty caused by the lifetime of the reactor system for the cell growth process and the gas scrubbing system is relatively high in both scenarios. The uncertainty of the worst-case is not equal to the sum of the uncertainties found for the individual parameters involved because the uncertainties of these parameters are not independent. Furthermore, when comparing per impact category the best- and the worst-case uncertainties in scenario 0 with those in scenario S, it appears that they vary more than one order of magnitude. This means that the substitution of fossil electricity by PV electricity affects the sensitivity analysis results. Additional uncertainties are caused by missing data about the energy consumption of the clean room, and by missing data about the arsine emissions during the ELO process. For the multi-Si module, there are also uncertainties regarding a number of inventory data (Jungbluth and Tuchschmid 2007). These uncertainties are mainly associated with the production techniques considered, e.g. the energy demand in the solar grade silicon (SoG-Si) production process and the emissions occurring in the production process. Uncertainties about light absorption by glass applied in the module, and uncertainties about the solar cell surface needed to reflect 1 kWp are similar for both modules. Because actually received solar irradiation varies, among other things, with the time of the day (during night-time in Western Europe, the irradiation even becomes zero), it will not be possible to produce PV modules in a full-time production process only by PV electricity without an appropriate back-up system for PV electricity. In studying the effect of replacement of fossil electricity by PV electricity on the environmental burdens, we have assumed that back-up of the PV electricity occurs through the grid. Application of PV electricity on an extended scale, however, will additionally require storage-type back-up systems (Denholm and Margolis 2007). Using these back-up systems will lead to an increase of the calculated environmental impacts of both the GaInP/GaAs module and the multi-Si module, but the quantitative impact thereof could not be estimated. Furthermore, for the solar scenario, we have assumed the cell and module production techniques and the techniques for the underlying and other associated processes, such as recycling, to be the same as current techniques. In the future, however, improved silicon, crystal, wafer, cell and module production techniques and other technical developments, which will improve the environmental performance of the devices, are expected. The highest normalised impact scores are found for marine freshwater aquatic toxicity. Marine aquatic ecotoxicity scores are largely related with emissions of metals. Although those emissions are rather uncertain as yet, the marine aquatic ecotoxicity scores have been indicated because it is felt that there may well be significant effects of changes in metal concentrations on marine aquatic ecosystems. It can be noted that there is much uncertainty concerning these effects, and to the representation thereof in current LCA methodology. The environmental burdens of a thin-film GaInP/GaAs solar module and a multicrystalline silicon module have been assessed in case their life cycle is based on the use of electricity that is generated by the corresponding PV modules. Comparison with the environmental burdens of the solar modules in case their life cycle is based on the use of conventionally generated electricity indicates a reduction, particularly of the impacts on global warming, abiotic depletion, acidification, and photochemical oxidation. The reductions of the toxicity scores, however, are smaller or negligible. This is caused by a decreased use of fossil fuels, on the one hand, and an increased consumption of materials for the production of the additional solar modules used for generating the required PV electricity on the other. For both PV modules, it is shown that full replacement of fossil electricity by PV electricity reduces the environmental burdens, particularly the fossil-fuel-related impacts such as impacts on global warming (see Fig. 3). Because the greenhouse gas emissions associated with the production of fossil-fuel-based electricity have a substantial share in global warming on a world-wide scale, switching to a more extensive use of solar power is helpful to comply with the present international legislation on the area of global warming reduction. As reductions in toxicity impact scores are smaller or negligible when fossil electricity is replaced by PV electricity, it is desirable to give specific attention to the processes which dominantly contribute to these impact categories. For the GaInP/GaAs module, it mainly concerns the production of chromium steel that is applied in the cell growth reactor system, and for the multi-Si module, it mainly concerns the production of aluminium that is applied in the module frame. In this study, a shift in ranking of several environmental impacts of the modules has been found when PV electricity is used instead of fossil electricity. The results of a comparative LCA can thus be dependent of the electricity mix used in the life cycles of the assessed products. The authors thank the reviewers of the paper for their useful comments.